When a movie theater in Lafayette, La., became the site of a violent shooting on Thursday night, the state's governor wasted no time in getting in contact with authorities and going straight to the scene of the crime. He then visited victims in the hospital and gave interviews with local TV station KLFY, as well as participated in a morning press conference regarding the incident. 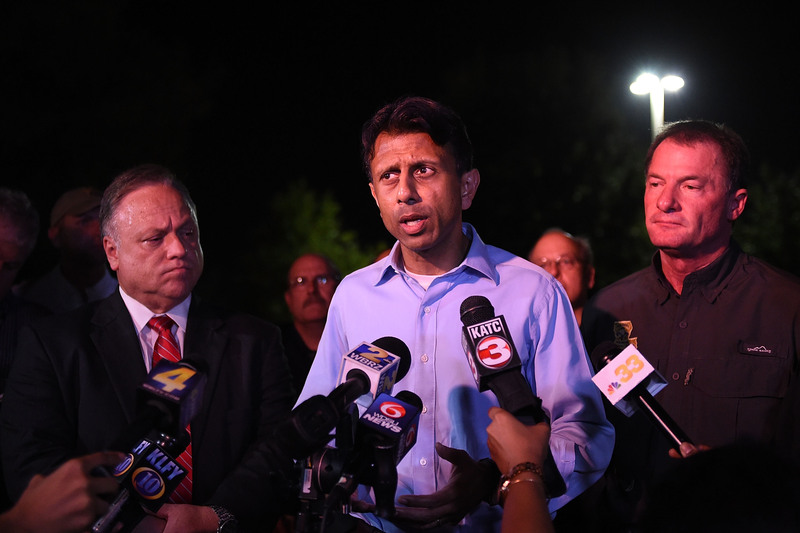 Bobby Jindal's response to the shooting wasn't enough, however. In fact, it barely scratched the surface, hovering just above the depths of an issue he continues to side-step in the wake of similar tragedies: gun control. I ask everybody: Keep these families in your prayers. Keep them in your thoughts. Shower them with love. The best thing we can do across Lafayette, across Louisiana, across our country is come together in thoughts, in love, in prayer. Right now we're just learning the details of what happened... Let's focus on the victims right now. Let's focus on their recoveries. There'll be a time, I'm sure folks will want to jump into the politics of this. Now is not the time. New York Times.His gubernatorial policies have made it so that those with concealed carry permits can bring their guns to restaurants — even those that serve alcohol — to say nothing of the fact that those permits now last a lifetime thanks to the passage of a 2013 law. That same year, the Violence Policy Center released a report stating that Louisiana ranked second in terms of most gun deaths in the U.S.
That it would take a tragedy like the shooting in Lafayette for the notoriously absent governor to return to his home state is an equally momentous issue. Jindal has suspended his political campaign indefinitely to focus on the developing investigation and aftermath in Lafayette. Though it's a step in the right direction, based on his track record, Louisiana citizens sadly can't hope for much more.